The Fifth District Court of Appeal ruled Tuesday that the University of Central Florida violated Florida law by covering up its Student Government Association’s spending controversies. “Today’s unanimous decision from the Fifth District reaffirmed the trial court’s well-reasoned ruling that student governments in the State of Florida do not get to spend the public’s money in the shadows. Their records are not secret ‘education records,’ and even if they were, the involved students waive privacy protections by running for public office,” said Knight News attorney Justin Hemlepp. UCF must now disclose the names of Student Government Officials using tuition money, collected from enrolled, fee-paying students, on all university expenditures. Knight News reported on this story in August of 2016 when UCF hid the names of Student Government officials using student fees in official documents released to the public. 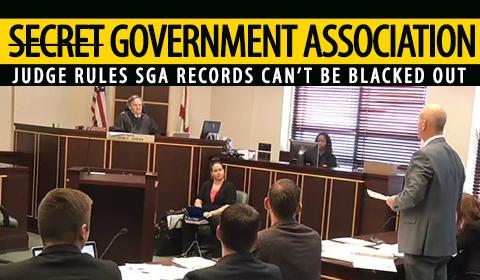 Circuit Judge John E. Jordan ruled last Summer UCF must provide unredacted Student Government financial documents – a victory for open-government advocates and student journalists. The controversy began early 2016 when Knight News submitted a request for documents relating to the expenditure of the Activity and Service Fee, a fee that every student pays as part of his or her tuition. The Student Government Senate decides how the $18.6 million Activity and Service Fee is allocated to different registered student organizations. Over a month passed without receiving the budgetary documents from UCF. Knight News then filed a lawsuit accusing the University of not providing the public records within a timely manner. A few days after the lawsuit was filed, the University sent versions of the documents which redacted the names of student government officers spending student money to lobby in Tallahassee, Fla. among other items. “Judge Jordan has correctly diagnosed the foundational hypocrisy in how UCF and other universities misapply FERPA for self-serving concealment purposes,” said SPLC Executive Director Frank LoMonte previously. UCF’s lawyers then appealed and brought the case to Daytona Beach to the Fifth DCA. They would lose their argument in Daytona Beach. “Here, this Court is tasked with determining whether [there are] alleged sufficient facts to denote a clear legal right to un-redacted copies of the Budget Request forms and A&S Fee Database records. This court finds that it has,” Judge Jordan wrote in the ruling that was affirmed by the Fifth District. Knight News has reached out to the UCF Board of Trustees Chair for comment about whether the Board will take a greater role in determining what lawsuits are worthy of appeal.